It is correct to write mother of pearl (without the hyphens) as well as mother-of-pearl (with the hyphens). Either way you want to write it is correct, but you may be surprised to learn that mother of pearl is not a pearl at all. Mother of pearl does have some similarities to pearls. For example, they both come from the ocean, they may be purchase in a wide range of colors and are often dyed. They are both, also a natural material, and very popular when it comes to jewelry designers. In the end though, pearls and mother of pearl are two different products. Mother of pearl is created from a composite material called nacre produced by some molluscs, such as oysters, and it also makes up the outer coating of pearls. It is strong, resilient, and iridescent. If you have ever opened an oyster shell and looked at the inside of it, you may have noticed how it has a luster to it, sort of a shiny almost oil slick affect. Nacre is continuously deposited onto the inner surface of the mollusc shell and helps defend the soft tissues of the mollusc against parasites and damaging debris by entombing them in successive layers of nacre, forming either a blister pearl attached to the interior of the shell, or a free pearl within the mantle tissues or mother of pearl. For jewelry designers, there are a multitude of supplies and products available made from mother of pearl. For starters, there are mother of pearl beads. These are regular round beads, of course, which vary in size from very small, around 3 or 4 millimeters in size, or much larger, such as around 12 millimeters in diameter. There are also lots and lots of bead shapes that are carved from the mother of pearl. Some of these can be free form—they are usually just parts and pieces of the original shell, and some are actually carved into discernible shapes: oval, flat oval, flat round, tube, rectangular, square, teardrop, tulip, crosses, round faceted, hearts, donuts, birds, clubs, and spades. Mother of pearl beads—no matter what size or shape—also tend to have issues as far as unusual texturing on the surface. This is especially noticeable in round beads. If you look closely at a few, they may be round but not perfectly round. This is due to variances in size and thickness of the natural material, so the surface is not always going to be perfect. To many jewelry designers, these variances are one of the elements of mother of pearl that make it so interesting. It makes every little piece unique and special. Most often you have probably seen mother of pearl as all white. Any time you see white mother of pearl, you can bet on it that it has been bleached. This sounds kind of bad, but many natural materials used in jewelry are often dyed or enhanced in some way. This is one reason why people tend to think of these as so similar to pearls as well since the coloring can be so much alike. Natural mother of pearl—meaning it has not been bleach, dyed, or enhanced in any way—is more of a mix of white, off-white, cream, and even a little beige. 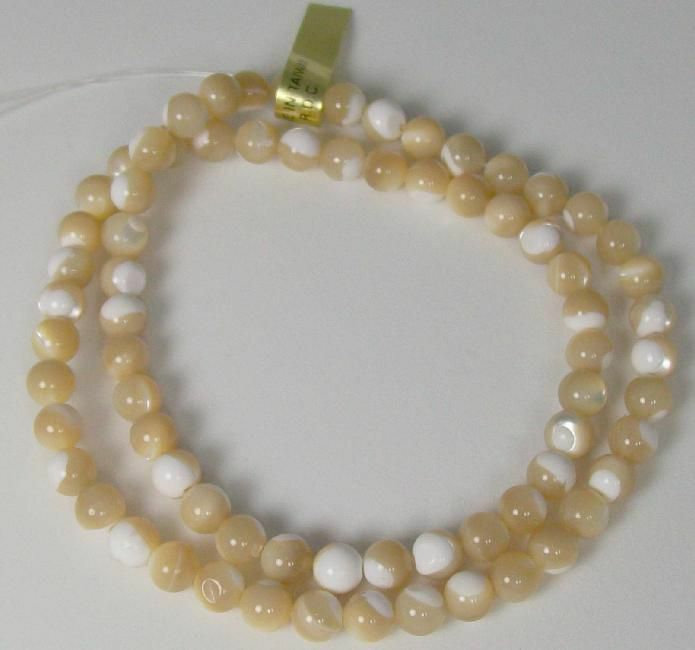 The natural coloring is a designer favorite as no two beads look at all the same. Add to that, mother of pearl is a wonderful neutral color that you can mix with all kinds of other jewelry making supplies. Finally, as far as color goes for mother of pearl, this material is often dyed, and some times it can be some really funky and fun colors like bright orange or hot pink or even grape purple. Mother of pearl is also used for pendants, not just beads. Sometimes pendants have mother of pearl inlay and sometimes they are carved directly from the shell. No matter what color, shape, or type you end up using, when it comes to mother of pearl you have endless possibilities. It tends to be very light weight so it works well for anything from earring to necklaces. It is also relatively speaking fairly inexpensive, especially compared to its sister material - pearls.